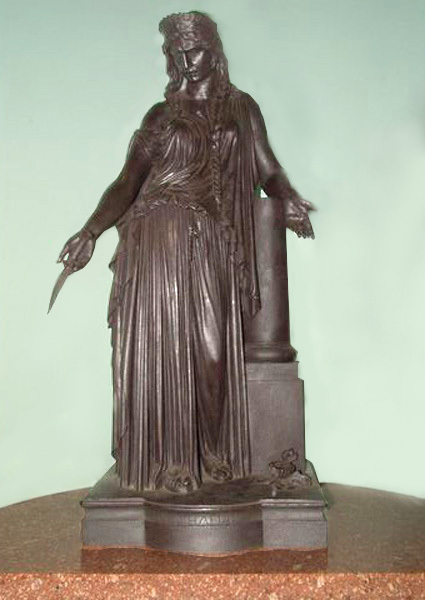 I have been consulting your splendidly informative website as I am preparing a very brief note for the Newsletter of the « Friends of the Bowes Museum » on the Museum’s silver version of Pradier’s standing Sapho. Nothing very academic, I’m afraid (in each issue, a « Friend » writes a short piece on a favourite item in the Collection and, as a friend of the editor, I have been pressed into service). Nothing I have read on John Bowes says when he acquired the statue, but research in the Museum’s archive may provide the answer. If I find out, I will let you know. Having worked extensively on Théophile Gautier, I am familiar with his articles in La Presse on the original bronze statue (23 April 1848) and on the casting of the silver one (9 December 1849), and will refer to these in my short note. I was particularly interested in Gautier’s description in the latter article of other works figuring in the 1849 Loterie des Artistes and in his account of Louis-Napoléon’s visit to the gallery in the Rue Basse-du-Rempart and apparent admiration for Pradier’s statue. Is it known who won the lottery? I have not managed to find the answer on the internet. I wonder if John Bowes, proprietor of the Théâtre des Variétés at that time, bought a ticket! I’m glad to know about your note for the Bowes Newsletter as I have several documents on the silver Sapho and the 1849 lottery. These include three articles published in L’Illustration and a letter from Pradier. The winner of the statue, a certain M. Louvrier, is identified in one of the articles as well as in Pradier’s letter. Pradier even sketches a little humoristic portrait of him in the letter and gives his addresss, boulevard Beaumarchais 8, which is also the address listed for him in the 1850 Bottin. If you like I can post copies of all that to you. I can also post copies of articles on the sculpture in the 1984-1985 Statues de chair exhibition catalogue and in Claude Lapaire’s recent catalogue raisonné of Pradier’s works. While we were preparing the exhibition our colleague Jacques de Caso travelled to Barnard Castle specially to see it and to have the metal analysed. Until then the museum thought it was simply silver-coated copper. You might be able to find his correspondence with the curator in the museum archives. It’s worth noting that during, or shortly after, the lottery Pradier began working on his ivory, gold and silver Léda et le cygne for another lottery. The swan is made of silver  perhaps silver left over from the Sapho casting? Concerning the gallery in the rue Basse-du-Rampart where the lottery items were on exhibit, it’s interesting to note that after Pradier and his wife Louise d’Arcet separated in 1845, Louise lived at n° 52 for a while in 1846-1847. The gallery was at n° 10. Finally, with regard to Théophile Gautier, his name comes up several times in my edition of Pradier’s correspondence, especially in vol. 3. It may come up even more often in the last two volumes, not yet published. Thank you so much for your prompt and informative reply and for your generous offer of further information. I have emended my short piece in order to mention Louvrier as the lottery winner, to thank you for identifying him, and to refer the readers to the Forum Pradier. Yes, please, I should very much like to receive all the documents you mention, but hesitate to put you to so much trouble. I had noticed the discrepancy between older guides to the Museum which describe the statue as « silvered copper » and recent references to « solid silver », without realising that this correction was due to your energy and expertise. I am fascinated to learn that silver left over may have gone into Léda et le Cygne. In respect of silver swans, it’s amusing to note that the Sapho in the Bowes is displayed only yards away from another silver swan, the eighteenth-century automaton that John Bowes purchased in 1872 from the Parisian jeweller Briquet. He had first seen it at the 1867 Paris International Exhibition, when it was exhibited by the jeweller Harry Emmanuel (this information I have taken from a guide to the Museum published in 2000). With regard to proving that the Bowes statue is solid silver, all the credit goes to Jacques de Caso, not to me, as you will see in his Statues de chair article and in the copy I’ve included of a lettter to him from the museum’s curator. If you do find out more about how it ended up in the Bowes collection, please let me know. Thank you for the treasure trove of documents that arrived today. The Statues de chair exhibition must have been tremendous. The catalogue of that exhibition and the catalogue raisonné are of great value, as are the contemporary documents from L’Illustration, etc., and the Pradier letter identifying the lottery winner. I have written to the museum archivist, Judith Phillips, to ask if any documents have been unearthed about the Sapho since 1984, when the then Keeper of Art’s letter to Professor de Caso indicated nothing was known of its provenance. I have not yet had a response but will let you know when I do. 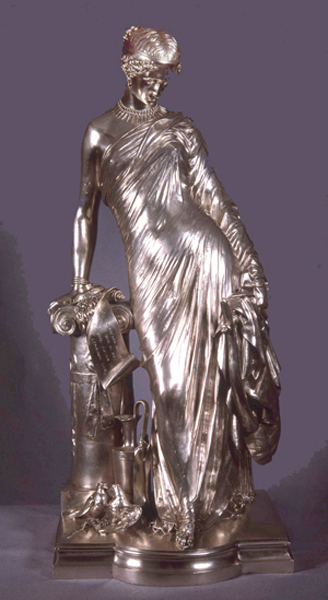 Many thanks for sending me the Autumn 2014 Bowes Newsletter with your article on Pradier's silver Sapho. I am attaching a Word version of the article here. It sums up perfectly the basic facts about the statue and I enjoyed it immensely. I hadn’t realized that there are only three other known half life-size castings of the work. It seems, too, that they are the only ones with the doves and the other attributes on the base. The Osborne House bronze stood outside on a balcony for more than a century and was so corroded when it was finally moved inside that it had to be covered with a rather thick coat of dark varnish to mask the damage. Consequently much of the fine detail has been lost. The same goes for its pendant, Médée, exhibited next to it. Below are pictures of both taken a few years ago during a visit I made to Osborne House with Claude Lapaire. There doesn’t seem to be a link to the Newsletter on the museum’s website www.thebowesmuseum.org.uk. Also, strangely enough, I find no entry for the Sapho in the on-line database of the Museum Collection, nor anything on Pradier or the statue (other than the Statues de chair exhibition catalogue) in the Library Catalogue and Archives databases. However, the Quick Guide to the contents of the Archives indicates that the archives include, among numerous other documents, « Bills from art dealers in France, Germany, Italy, Belgium and England (inc material now in museum) 1860s-1880s » as well as « Sale and exhibition catalogues 1850s-1880s ». And I see on another page that the museum is seeking volunteers « to help in the new Archives Reading Room, which may involve transcribing John and Joséphine Bowes’ bills, receipts and correspondence ». Does this mean that the archives inventory is still incomplete? Surely there is something in them about the Sapho. I would be very keen to know when, and from whom, it was purchased. Please let me know if you find out anything more. I have raised your point about there not being a direct link to the statue on the Bowes Museum’s website with the archivist, Judith Philips, and hope this will be remedied. I understand from her that the bills etc. have all been catalogued and translated but, oddly, there seems to be no reference to Pradier. Of course, something may have been overlooked, so I have not entirely given up hope of finding out about the acquisition. I wonder if the silver Sapho is mentioned in any of the sales catalogues kept in the Bowes archives. I hope in any case that some trace of it will eventually be found. I am very happy to be in touch with you and will keep a regular eye on the Forum Pradier. 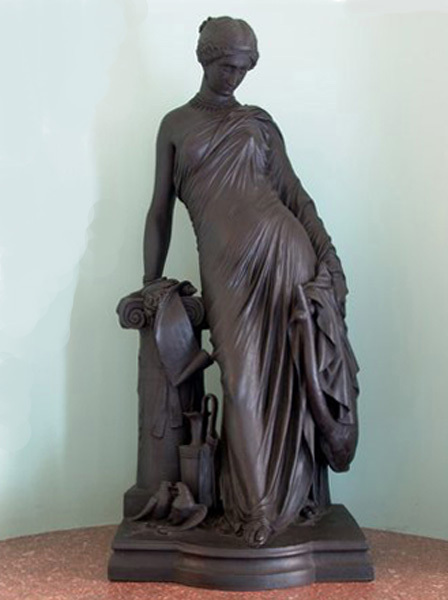 Like you, I hope that more information on the Pradier Sapho in the Bowes Museum will be forthcoming!